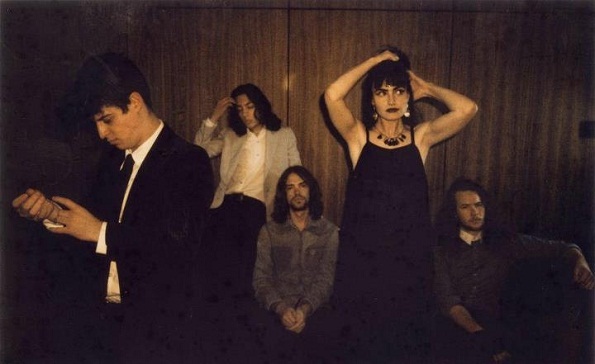 The sound of Sydney five-piece The Preatures (formerly The Preachers) ranges from The Birthday Party-era Nick Cave with the yelping immediacy of early Kings Of Leon, to gusts of Patti Smith streaming through Fleetwood Mac pop-craft. Gideon Bensen and Isabella Manfredi split lead vocal duties. There is a bit of voluptuous interplay in Benson’s sexed-up romps, such as recent single “Take A Card,” while Manfredi’s encompassing lead presence calls on no company. Guitarist Jack Moffitt plays his array of picked out reverberating licks with ardent energy, suggestive of performing an imperative task. The bass riffs hop like the bottom end of The Doors and the drumming is prominently solid without being flashy. The strikingly clad five-piece have a radiant chemistry, leaving no doubt that they are meant to play together.